When Valeros and his companions are tasked with tracking down a mysterious beast scaring the locals of Sandpoint, they find far more than they bargained for! A seemingly simple monster hunt becomes a twisted tale of danger and betrayal as the Cult of Lamashtu exacts its revenge on our iconic heroes. Paizo's award-winning tabletop RPG, fiction line, and card game is the ultimate fantasy comic! With an action-packed story written by Jim Zub (Samurai Jack, Skullkickers) and lavish artwork by newcomers Sean Izaakse and Ivan Anaya, this second volume continues the thrilling adventures of the Pathfinder iconic characters in the richly envisioned fantasy world of Golarion. This beautiful, oversized RPG-sized hardcover collects issues 7-12 of the comic series along with the 2014 Pathfinder Special, and includes 28 pages of encounters, characters, and world detail for the Pathfinder Roleplaying Game, including a brand-new poster map!
? 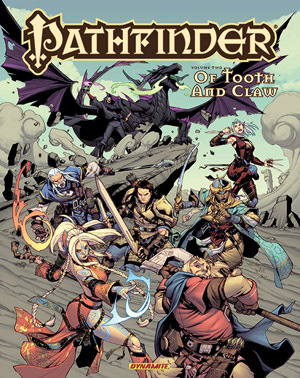 A beautiful RPG-sized hardcover collecting issues 7-12 of the Pathfinder comic series.
? An adaptation of the adventure from the best-selling Pathfinder Beginner Box, making it a perfect jumping on point for game fans and new readers alike.
? An extensive cover gallery of alternate cover illustrations.
? More than 30 pages of encounters and world detail for the Pathfinder Roleplaying Game.
? A brand new poster map. Dynamite, Dynamite Entertainment & The Dynamite Entertainment logo ® 2016 Dynamite. All Rights Reserved.